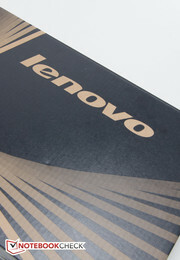 While many business users will still predominantly associate Lenovo with the well-known and more conservative ThinkPad line, regular home users are well aware that the PC maker's offerings span the whole gamut of personal computing from tablets and mainstream notebooks to Ultrabooks and various convertibles like the popular Yoga-series. 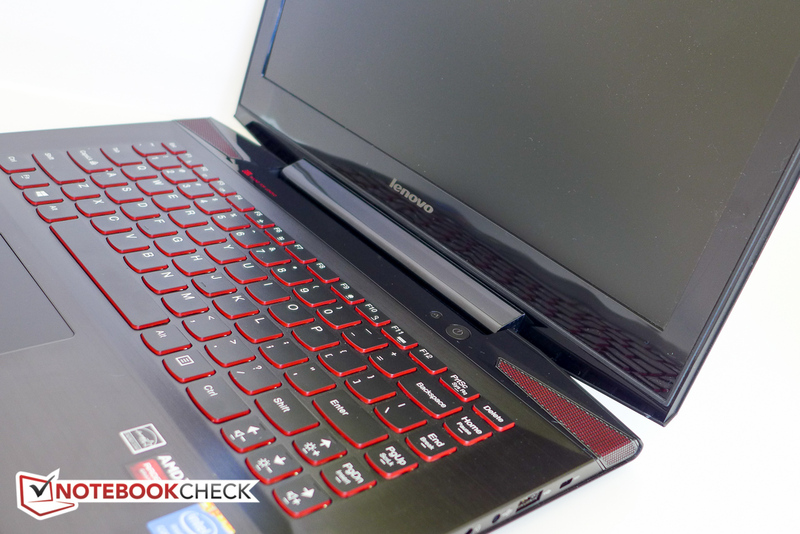 In recent years, Lenovo has repeatedly ventured into the gaming market as well and has made some significant inroads with notebooks that provide, quite simply put, a lot of bang for the buck. Case in point: last year's dual-GPU capable IdeaPad Y510p, which was a well-received notebook selling for hundreds less than its competitors. 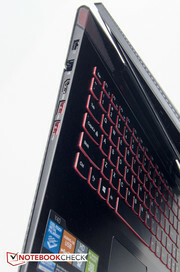 The current Y-series, which Lenovo calls "Premium Multimedia Laptops" on their website, encompasses models from 14 to 17.3-inches without and - in case of the Y70 - with touchscreens. 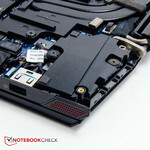 Both the 14-inch Y40 (Lenovo now seems to have dropped the "IdeaPad" name) and the recently reviewed 15.6-inch IdeaPad Y50 are updates to the previous-generation Y510 and Y410 siblings. Although the new Y40 appears to be a scaled-down version of the Y50 much in the same way as the Y410 was a smaller version of the Y510, the two new systems do not only differ in size, but hardware as well: while the Y50 makes use of a quad-core Core i7-4700HQ or i7-4710HQ and comes with a Nvidia GTX 860M GPU, our 14-inch test candidate is outfitted with a dual-core ULV i7 CPU and a more mid-range Radeon R9 M275 GPU. 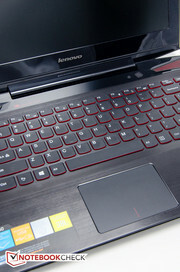 At the time of writing, Lenovo offers seven different Y40 models within the series and a single version of the older Y410p as well. The least expensive version retails for $750 and comes with an 1.7 GHz Intel Core i5-4210U processor, 8 GB of RAM and a hybrid 500 GB hard drive with a 8GB solid-state cache drive; the top-of-the-line configuration sells for $1200 and has a 2 GHz Intel Core i7-4510U Processor, 16 GB of RAM, and a 512 GB SSD. The Radeon R9 M275 is the only available GPU option across the board. 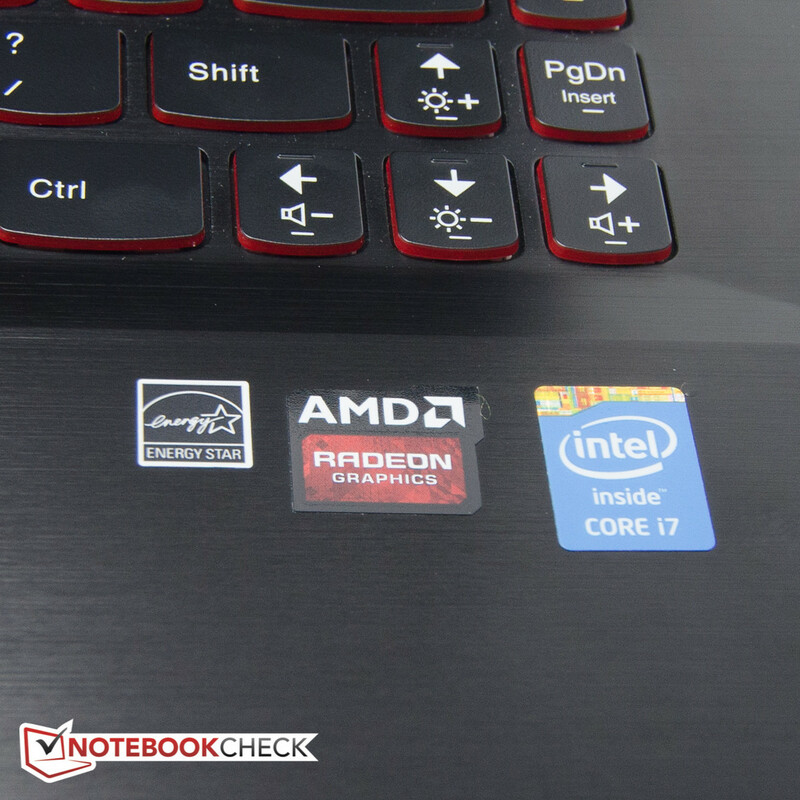 Our review notebook features a 1.8 GHz Intel Core i7-4500U, 8 GB of RAM, and a 256 GB SSD. 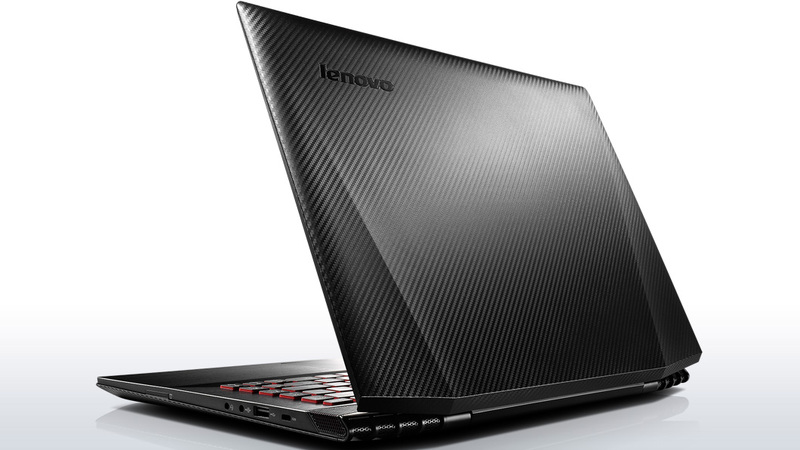 On Lenovo's website, the updated version with the slightly faster Core i7-4510U, but otherwise identical specs, sells for $850. Just by looking at the hardware configuration, it shouldn't come as a surprise that the performance of the Y40 lags behind the more powerful Y50. 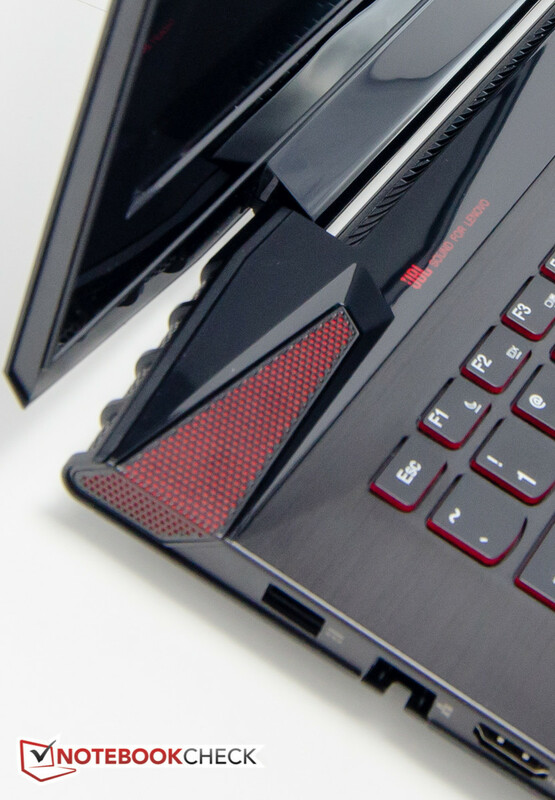 To get an idea of where the Y40 sits performance-wise, we'll compare it not only to the bigger Y50, but also take a look at other 14-inch gaming systems. 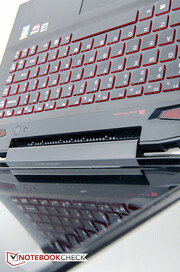 The overall design is very angular with sharp lines and mirrors the larger sibling Y50 down to the wedge-shaped speaker grills located to the left and the right behind the keyboard deck, the honeycomb-styled vent intakes on the rear, and the red accent color used in several key areas. While the Y50 features a brushed metal exterior and a matte rubberized soft-touch palm rest, the IdeaPad Y40 comes with a matte faux carbon fiber lid and brushed metal palm rest / keyboard deck instead. 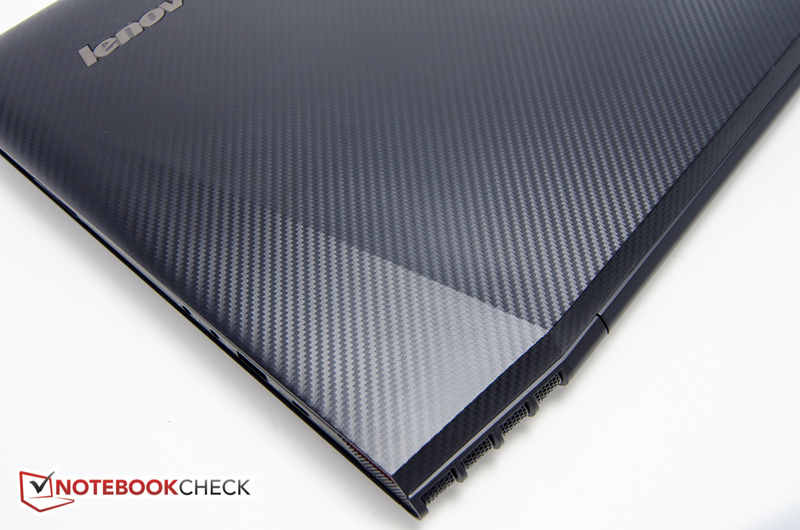 The bottom of the notebook features the same carbon look as the lid, reducing the number of materials and textures Lenovo uses for this machine - the Y50 is less uniform as far as the materials are concerned. The bottom panel is a single piece, which is attached with eleven Phillips-style screws. The lid and the back are textured, which gives the fingers something to hold on to without having to worry about slippage. As a consequence, neither are very susceptible to smudges, but the metal palm rest frequently had us reaching for a cleaning cloth. Still, fingerprints are less of any issue than they are with some glossy systems. The display bezel as well as the cover for the single hinge are made from black shiny plastic, which looks quite cheap and potentially scratches easily. Although the use of plastic for the back of the lid might disappoint those familiar with the Y50, the overall look of the Y40 is still still quite appealing and elegant nonetheless. The notebook should please those who are trying to find a decent-looking system that isn't as overtly flashy with in-your-face optics as some other entries in the gaming category. We should also point out that it's important to keep the price in mind as well: the striking design of the very Ultrabook-like Razer Blade 14 might elicit more oohhs and aahhs, but does so at more than double the cost. As we've pointed out in our review of the bigger brother, the new Y-series has lost its Ultrabay - designed to hold a second GPU, a hard drive, or an optical drive - which allowed it to slim down considerably. The Y40 measures 350 x 249 x 23.8 mm and weighs just a tad over 2 kg, which is a far cry from the portly predecessor Y410 (about 33 mm thick and 2.5 kg) or the rather hefty Alienware 14 (42 mm and 2.94 kg) The uber-sleek Razer Blade 14 is significantly slimmer at only 17 mm and a bit lighter at 1.9 kg; the Asus VivoBook S451LB measures 22 mm and weights 2.2 kg, but houses an optical drive as well. We have no quibbles with the overall build quality, as the various parts fit together tightly without obvious differences in gap size or noticeable sharp transitions. Because of the triangular bevel-design off the lid as well as the bottom, the notebook has two rubber feet on the bottom up front, but only a single long (about 20 cm) rubber foot in the back. Pressing down in the rear left and right allows the corners of the notebook to flex downwards slightly, although this clearly doesn't affect usage at all. 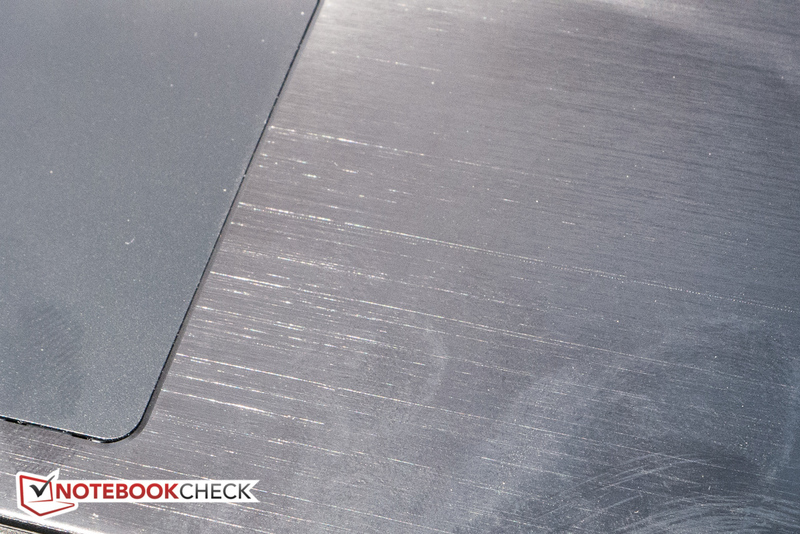 The single hinge holds the display securely enough up to 135 degrees, although we think that the design needs to be improved should Lenovo ever decide to outfit the Y40 with an optional touchscreen like the much larger Y70. The aforementioned black plastic hinge cover not only looks cheap, it also emits creaking sounds when pressed. Torsional rigidity is quite decent for the base unit, but the lid does flex rather easily and firm localized pressure on the back does introduce some visible ripples. For the price point, the quality is still impressive. 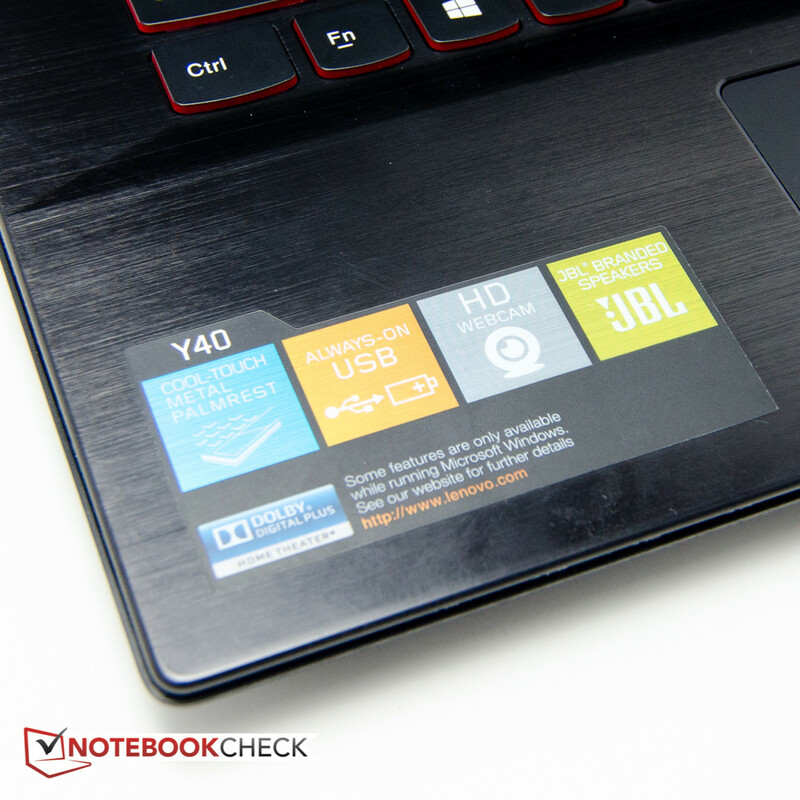 As far as its physical ports are concerned, the Y40 yet again mirrors the 15.6-inch Y50. The sole connectivity to external monitors is provided by the single HDMI port since neither a VGA nor a DisplayPort are available. The placement of the ports is close to ideal, as they are pushed towards the back, leaving the desk relatively uncrowded even if cables and devices are plugged in. The SD card slot on the right side is not executed very well: because the bottom of the notebook does not sit flush with the sides and the mechanism requires the card to be pushed in quite deep before it engages / disengages, swapping cards using just the fingers becomes an exercise in patience. We found it much easier to use the supplied blank to push the card in to get it to release. Just like its bigger brother, the Y40 uses a 1x1 Intel Wireless-AC 3160 Mini PCIe card with integrated Bluetooth 4.0 for wireless connectivity. The card supports 2.4 GHz and 5 GHz (only one band at a time though) and is the only available WiFi option. During the review period, we had no problems connecting to our wireless router and achieved the same signal strength we saw on another laptop equipped with the same card. Cable-bound Gigabit Ethernet is provided by a Realtek RTL8168/8111 chip and makes use of drop-down RJ45 connector, which is one of the sturdiest implementations of this type of connector we have seen so far. 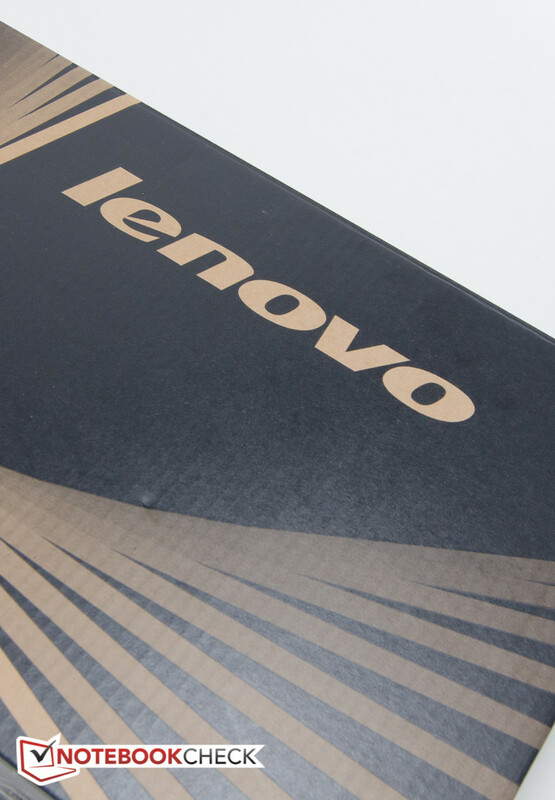 Lenovo provides no accessories for the Y40, and the shipping carton only contains the notebook, the power adapter, and various pamphlets. Dedicated accessories are also not available. 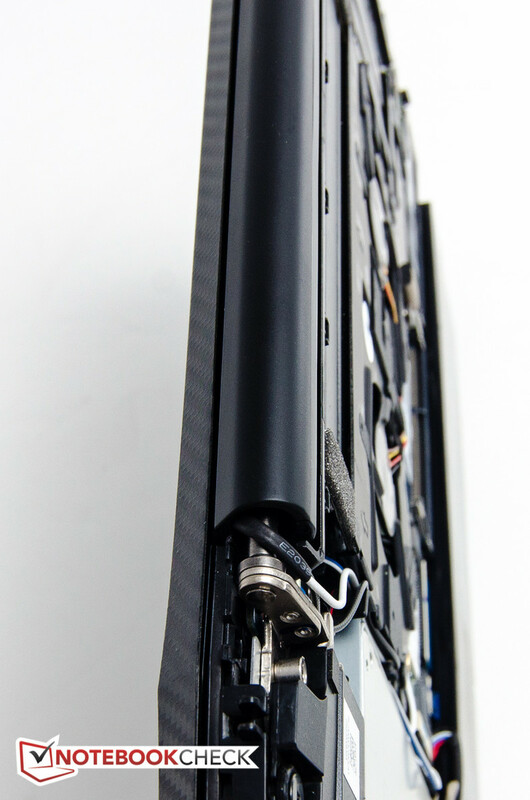 There is no traditional maintenance cover, as access to the hardware components requires the removal of the entire bottom panel. After eleven Philips screws have been removed, the panel simply pops off. This process can be a little tricky the first time around, but we had no problems on subsequent attempts. 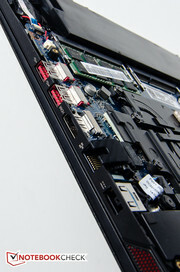 Once the panel is removed, the user has access to the DIMM slots - one is occupied, the other one open - as well as the hard drive, wireless card, and the battery. 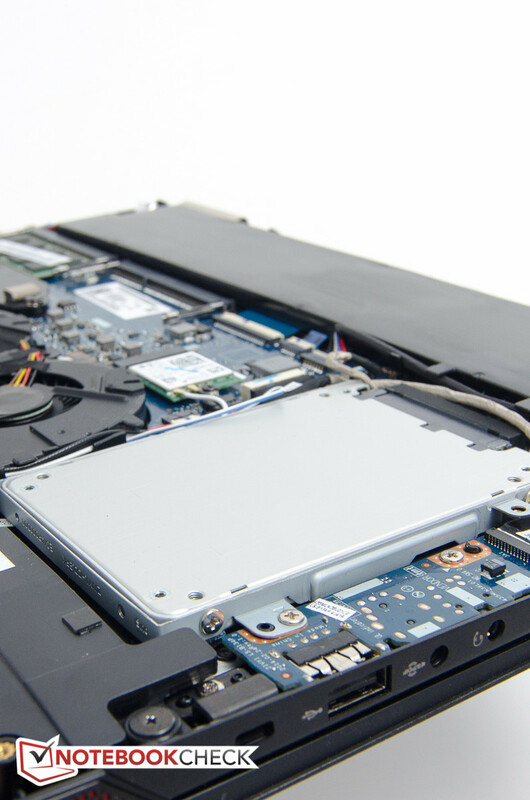 We should mention that removing the hard drive requires removal of the battery first - but since the battery is screwed in and not glued, this isn't really an issue, although a little more work is required. 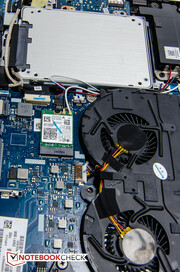 The two cooling fans are accessible as well, so cleaning them is quite easy. 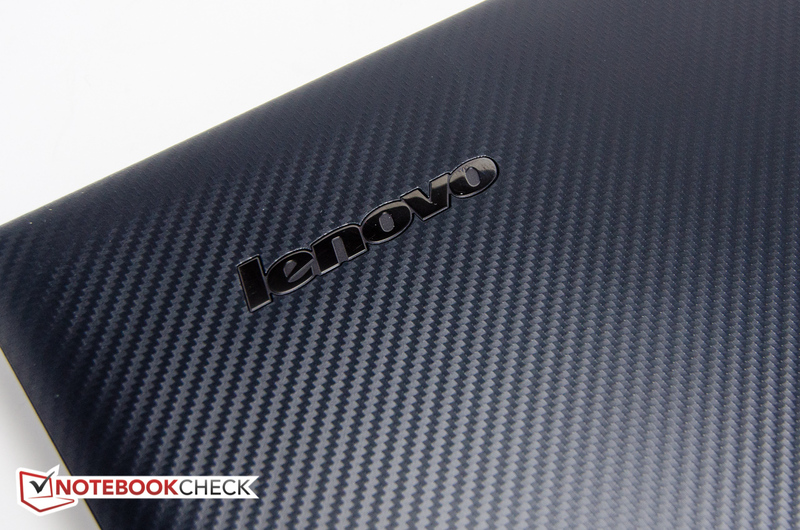 Lenovo warrants the Y40 for 1 year against manufacturer's defects. For $20, the warranty can be upgraded from Depot to In-Home service; a 2-year Depot warranty costs $50. The most comprehensive coverage of 3-year In-Home service with Accidental Damage Protection is offered for just over $190 at the time of writing. Lenovo also offers Premium Support, for users requiring more comprehensive support. The chiclet-style keyboard has smooth plastic keys that are entirely flat. Key travel is shallow and the feedback quite spongy, enhanced by the fact that the keyboard tray flexes easily when pressure is applied, particularly in the middle. 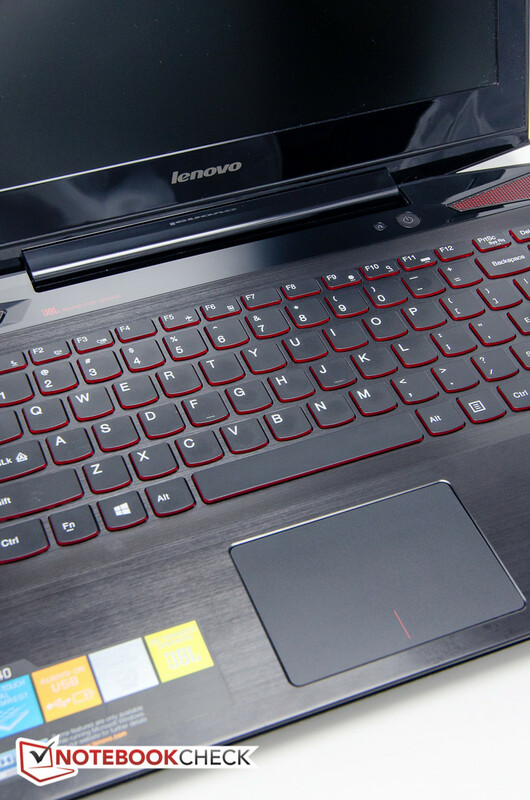 After an adjustment period, we were still able to type reasonably fast and accurately, although other versions of the AccuType keyboard in Lenovo's arsenal provide a much better typing experience. 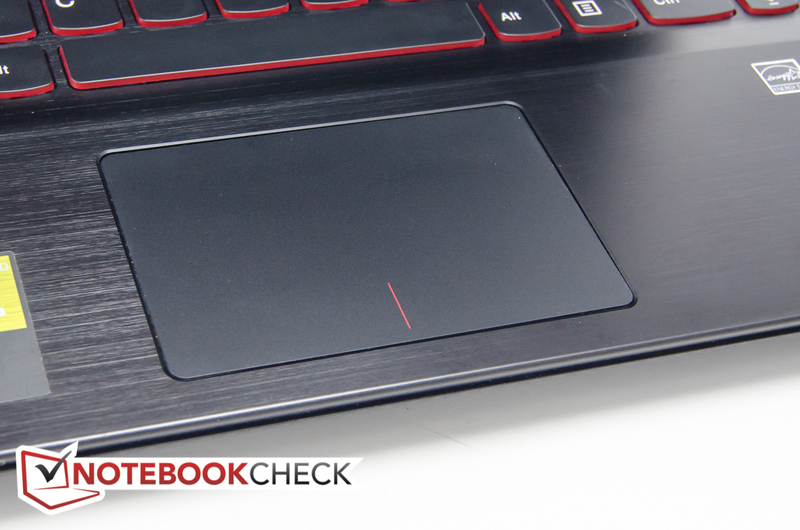 Another issue we have with the keyboard is the fact that Lenovo omitted a backlight. While the keyboard of the Y50 has two backlight settings, the keys of the Y40 have shafts that are simply painted red. 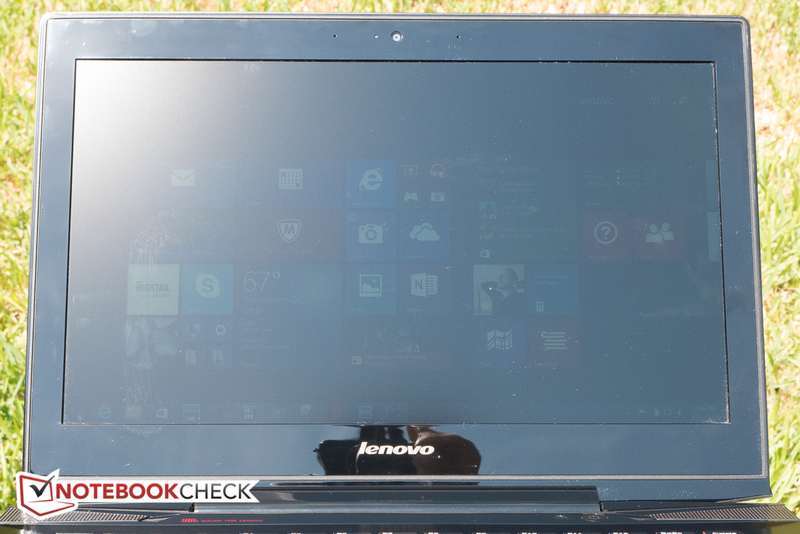 In our opinion, Lenovo has taken the cost-cutting measures too far here, since a gaming notebook definitely benefits from a backlight in dimly-lit environments. The Elan Smart-Pad measures 9 cm x 6 cm and features a smooth surface that allows the fingers to glide easily. Overall operation is responsive as well as predictable. Multi-touch gestures are supported of course and zooming, rotating, and swiping gestures work very well. The software allows for numerous adjustments, so the user can configure the touchpad's behavior as desired. The integrated mouse buttons have shallow travel but provide clear tactile and audible feedback. Like the bigger 15.6-inch Y50, Lenovo equips the 14-inch Y40 with a Full-HD panel with a resolution of 1920 x 1080 pixels. The predecessor Y410 came with a resolution of 1600 x 900 pixels. Many high-end 14-inch gaming notebooks, like the Gigabyte P34G v2, the Alienware 14, as well as many 15-inch systems also come with a 1080p screen, so our review model is in good company, especially considering its budget status. The Razer Blade 14 offers 1600 x 900 pixels, while the older and significantly less expensive Asus VivoBook S451LB had to make do with 1366 x 768 pixels. The display is matte as well, which is certainly appreciated for gaming as well as most other tasks, as the treatment cuts down on glare significantly. 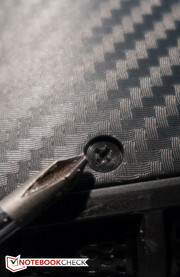 Other panels for the Y40 models are not offered. Unfortunately, the screen of the Y40 is quite dim. We measured an average brightness level of less than 200 nits across nine quadrants, which pales in comparison with other systems like the Razer Blade 14 at 340 nits or the Gigabyte P34G v2 at about 270 nits. Only the screen of the VivoBook is equally dark. In addition, the brightness distribution is not that great at 78 % and the screen is darker on the right edge, although that is not really noticeable during normal use. The maximum brightness drops to less than 170 nits in the center when the notebooks is running on battery power, which requires higher brightness settings in a normally-lit work environment to allow for comfortable viewing. Backlight bleeding around the edges, which is a problem sometimes affecting even high-end panels, is not an issue here at all. The contrast ratio of about 260:1 is also far from satisfying and impacts dark scenes during gaming as well as when watching movies, as blacks are represented as washed-out dark grays instead. Combined with the low brightness, night scenes and darker sequences are often not very enjoyable. Many gaming notebooks offer much higher ratios of about 1000:1, although the Razer Blade 14 isn't significantly better here than our review candidate. We use a X-Rite i1Display 2 colorimeter to measure the color space reproduction. 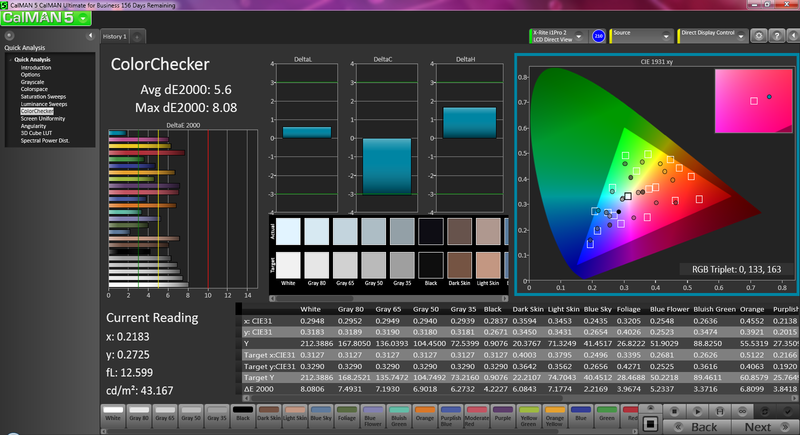 With just under 50 percent and about 35 percent coverage of the professional color spaces sRGB and AdobeRGB, the results are once again not very impressive. Of course, the notebook is not meant for photo or video editing, so normal end-users will probably not have an issue with the lower-than-average color reproduction. 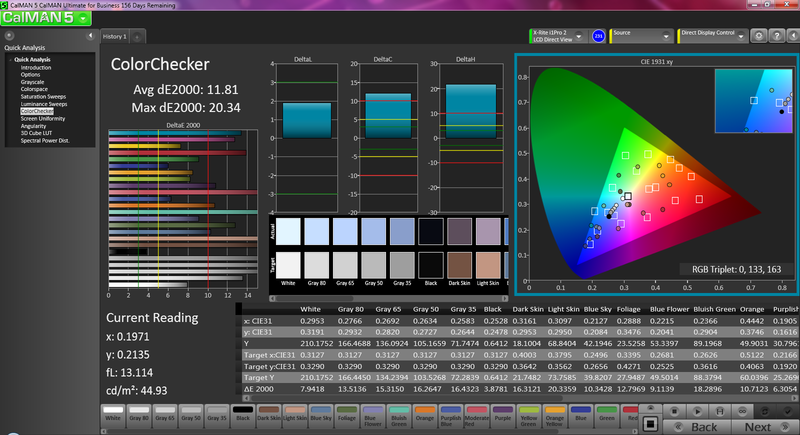 The displays of the larger Y50, the Razer Blade 14, as well as the Asus VivoBook S451LB - which are equipped with TN screens as well - offer an almost an identical coverage of the color spaces; only the premium TN panel Dell uses for the Alienware 14 achieves 62 percent of the AdobeRGB color space. Notebooks equipped with IPS screens usually have less of an issue with coverage here (Gigabyte P34G v2: 58 % AdobeRGB). Of course, TN screens tend to have better response times, which is important for gaming and one of the reasons why the technology is still used even for rather pricey notebooks in this segment of the market. Our analysis of the review model's color reproduction using a X-Rite i1Basic Pro 2 spectrophotometer and CalMan 5 software reveals exceptionally inaccurate colors. With average DeltaE-deviations of almost 12 for color and 13 for grayscale, the Y40 misses even the low standards set by most budget display panels. The color temperature of over 17000K (ideal: 6500K) results in a very cool representation as shipped with blue, red, purple, and magenta way off the ideal values across all saturation levels. 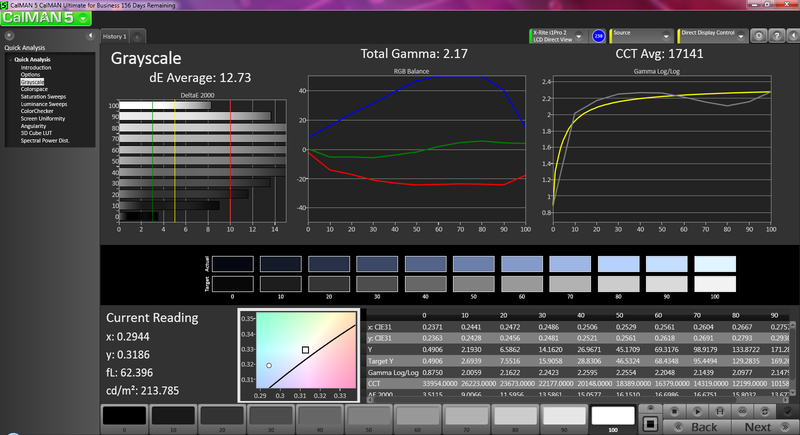 Calibration does improve the results significantly with only red and purple still outside the norm by a fair margin. As always, we should point out that most users are likely going to be happy with the colors as shipped, which is important since most gaming notebooks are going to remain uncalibrated. The Y40 is actually still somewhat usable outdoors despite the low overall screen brightness. Since the panel is matte and doesn't have any issues with glare, working outside in the shade is still possible most of the time. Of course, exposing the notebook to direct sunlight is simply out of the question and even indoors strong light sources are best avoided, since the panel gets very dim, colors appear washed out, and text gets hard to decipher. 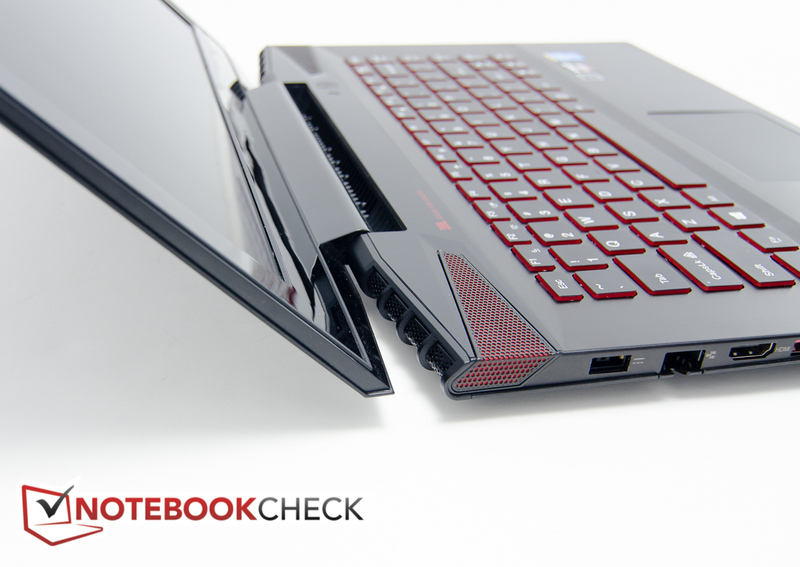 We'd still rather take the Y40 outside than a notebook with a brighter, but highly reflective screen. The viewing-angle stability of our Y40 is unfortunately far from great. Since the screen uses TN technology, the ideal viewing window is small and restrictive. When the screen is tilted backwards even just a few degrees from a head-on view, the content darkens significantly especially up on the top edge. 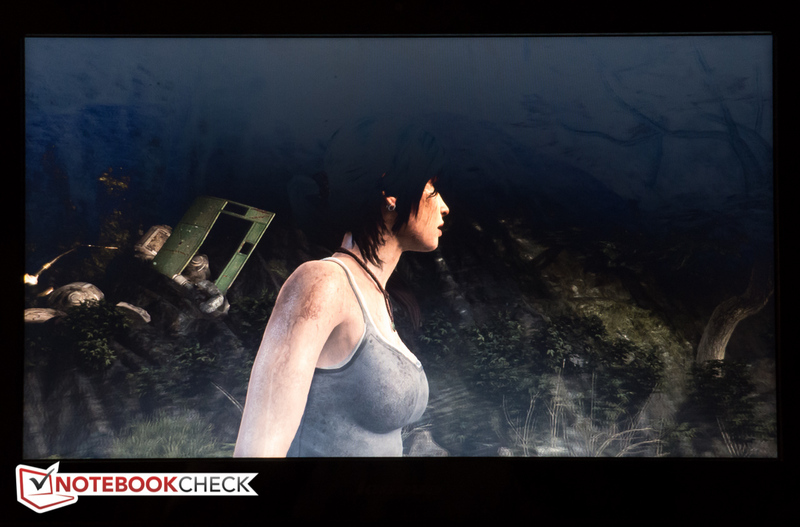 This was particularly noticeable when we played the benchmark scene in Tomb Raider, during which the mountains in the background were rendered almost invisible unless we positioned the screen so we were looking at it from slightly above. Of course this effect is much less pronounced when the scenes are bright and colorful. Lenovo's webpage lists just two processor choices for the Y40. The various versions of the notebook either come equipped with an Intel Core i5-4210U or an Intel Core i7-4510U processor. At the time of writing, Lenovo is selling the model with i7 CPU and a 1 TB SSHD drive for $10 less than the model with i5 and a 500 GB SSHD drive, making the choice virtually a no-brainer. 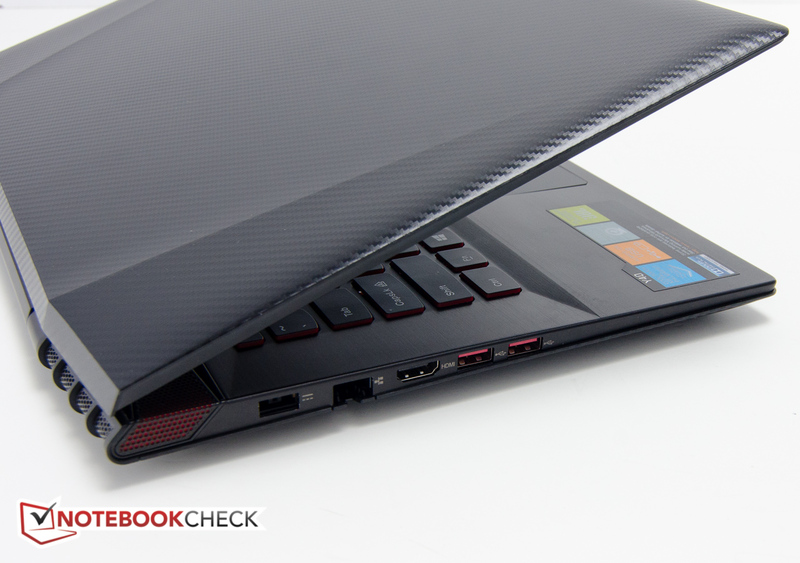 Our review model is equipped with an Intel Core i7-4500U, which is not an option any longer. The performance difference between the i7-4510U and i7-4500U should be not that significant, however, since the i7-4510U is only clocked 100-200 MHz higher. In addition to the dedicated Radeon Graphics, AMD's Switchable Graphics-technology can also utilize the CPU-integrated HD 4400 for less graphic-intensive tasks. 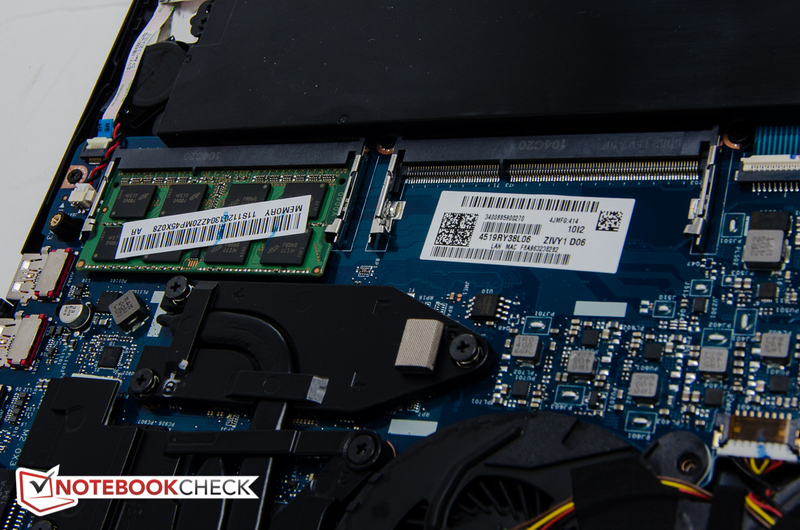 Our review notebook shipped with a single 8 GB PC3-12800 RAM module from Samsung. An additional DIMM slot is open, so it's easy to upgrade the notebook to 16 GB total, although the bottom panel needs to be removed to allow access. The Y40 has a regular 2.5-inch hard drive slot which is - depending on the model - equipped with either a Hybrid 500GB + 8GB SSHD, a Hybrid 1 TB + 8GB SSHD, or a 256 GB or 512 GB SSD. 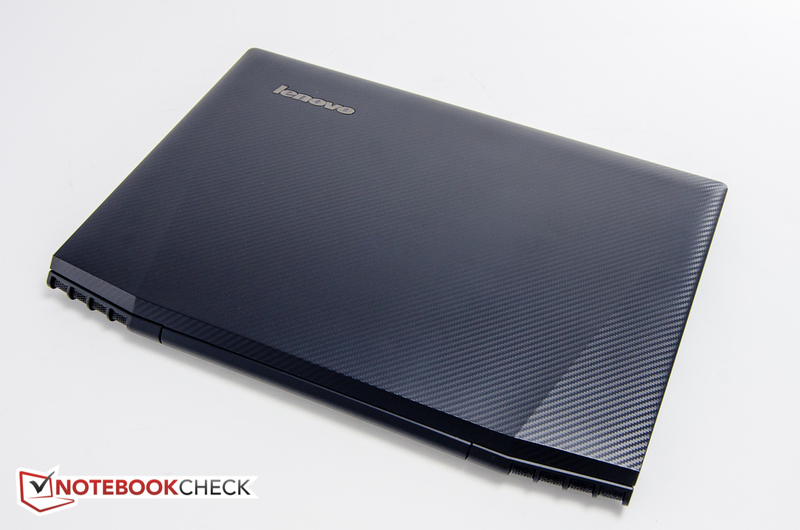 As we mentioned above, our review notebook is equipped with a dual-core Intel Core i7-4500U processor. This Haswell-generation CPU has a nominal clock speed of 1.8 GHz, but features a Turbo which can overclock a single core 3 GHz or both cores to 2.7 GHz. Performance is right where we would expect it with Cinebench R11.5 scores of 2.74 points (Multi) and 1.3 points (Single) and very much in line with other notebooks featuring the same CPU. 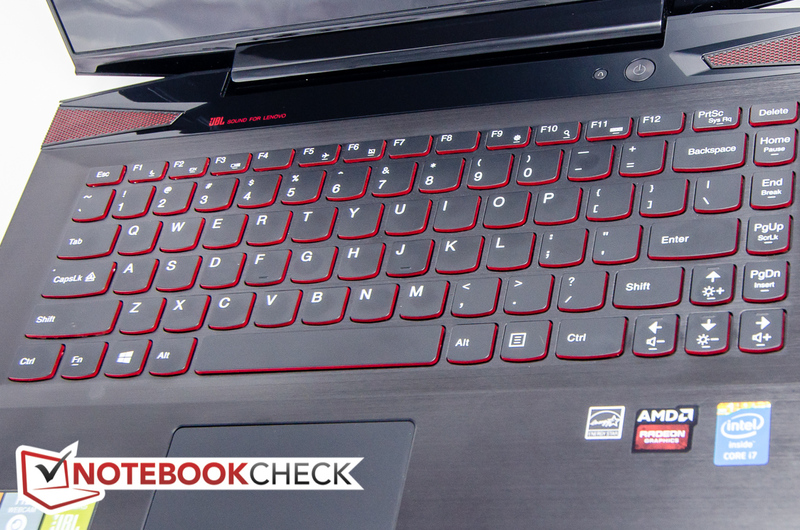 With its Core i5-4200U CPU, the Asus VivoBook S451LB is slightly slower with 2.49 and 1.12 points, respectively. The much more expensive Gigabyte P34G v2 gaming notebook is equipped with quad-core Intel Core i7-4700HQ and offers about 20 % more single-core performance, but provides an increase of over 140 % when all four cores are in use. Of course, this processor also has a TDP of 47 watts according to Intel, while the i5-4200U just consumes 15 watts. During the Cinebench Multi-test, the processor cores started out at 2.7 GHz and dropped to 2.5 - 2.6 GHz about 15 seconds into the test with the CPU hovering around 65 degrees Celsius. A repeat of the test with the notebook running on battery power with either the High Performance or the Balanced profile active revealed no difference in performance whatsoever. 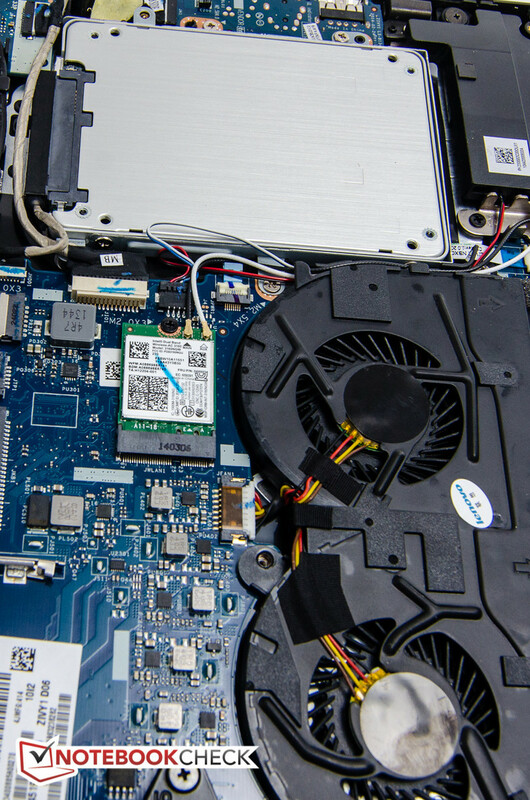 We use Prime95 and Furmark while monitoring with the tools CPU-Z, GPU-Z and HWiNFO to see how the Y40 handles maximum workloads and to identify potential throttling issues. With Prime95 active, the CPU cores operated at their maximum Turbo Boost frequency of 2.7 GHz before dropping down to between 2.4 - 2.6 GHz with the temperature rising to about 65 degrees C. Neither the speed nor the temperature changed for the remainder of the test. FurMark on its own had the Radeon GPU initially running at a core clock speed of 925 MHz with a memory clock of 1000 MHz. After a minute, core and memory clocks dropped to 900 MHz and remained there while the temperature of the GPU increased to a high of 90 degrees C. Although the CPU was idle during this part of our test, the temperature of the chip increased to 75 degrees C nonetheless, which resulted in the CPU cores dropping to 1.5 GHz from their normal idle speed of 2.7 GHz with the High Performance profile active. With both Prime95 and FurMark running in parallel, the GPU dropped quickly to core and memory speeds of 400 and 305 MHz respectively. The temperature, which had reached 90 degrees C with just FurMark active, now never exceeded 63 degrees C. The CPU stabilized at 64 degrees C after initially reaching as much as 80 degrees C with the cores not exceeding 1.5 GHz. The system remained like this with no changes. Since the fan was not working particularly hard and the temperatures seemed low, we rebooted the system and restarted the test after a cool-down phase. This time, the GPU again dropped to 400/305 MHz with a temperature of less than 63 degrees C, while the CPU now stabilized at 72 degrees C after peaking at 80 degrees C as before with the cores running at 2.4 GHz. A third attempt had the CPU cores dropping down to 1.5 GHz almost immediately with a temperature of 74 degrees C, while the GPU maintained 925/1000 MHz at about 80 degrees C. 10 minutes later, the CPU dropped to 1.2 GHz, while the GPU still maintained 925/1000 MHz with occasional dips to 900/900 MHz. The attached screenshot shows the second scenario after a run time of 3 hours. It seems that the behavior of the system under stress is not always predictable - a subject we will touch upon again in our section about the battery life. A test with 3DMark11 immediately following the stress test showed no statistically significant difference in the result. As we mentioned earlier, tests with Cinebench R11.5 showed identical performance with the notebook plugged in and running on battery power. The picture changes when the GPU comes into play: running 3DMark11 with the notebook on battery power resulted in a roughly 8 percent lower score; Unigine Heaven 2.1 ran about 20 percent slower. When we unplugged the Y40 while running Heaven, we saw an immediate drop of the GPU to 400/305 MHz from the initial 925/1000 MHz, which of course explains the results. 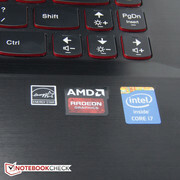 Since this is a gaming notebook, the lower performance on battery power is not uncommon, albeit a little inconvenient. 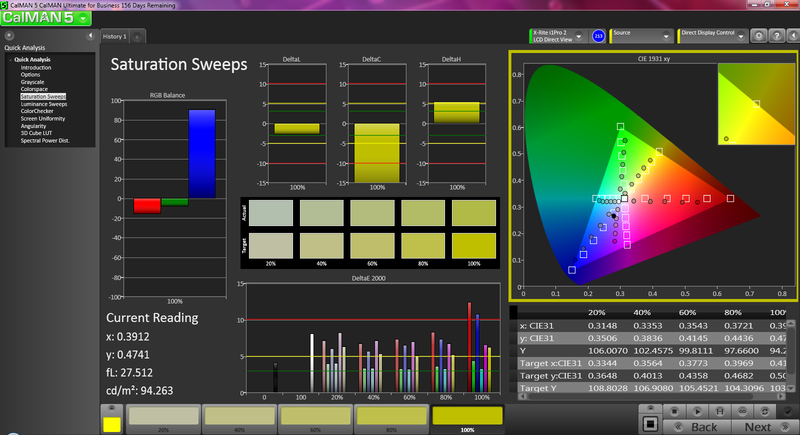 As always, we use PCMark 7 to evaluate the overall system performance. 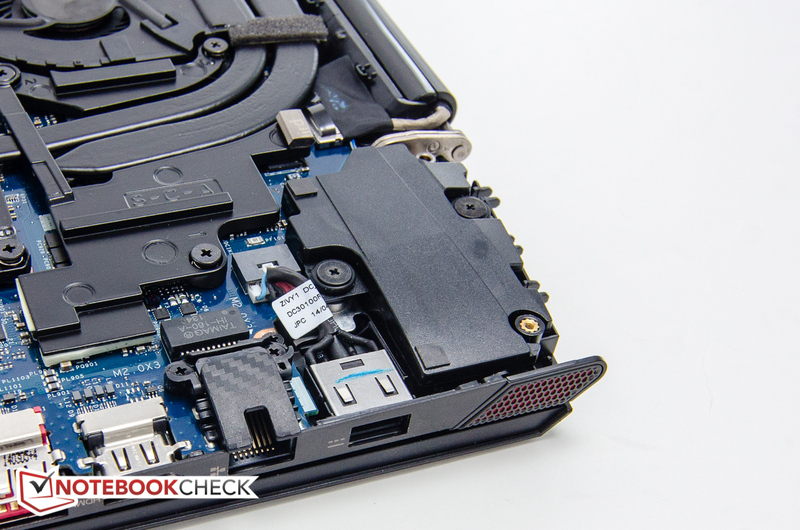 Thanks to its Liteon SSD, the system posted a very good result of 4921 points - miles ahead of the Asus VivoBook S451LB, which is equipped with a standard platter-based hard drive and scored 2834 points (-42%). Even Lenovo's own Y50, which features a more potent CPU and GPU, but relies on a conventional hard drive with SSD cache, can't come close with only 3006 points (-39 %). Gibabyte's P34G v2, also equipped with a Liteon SSD, outperforms our review model with 5400 points (+10 %), although the gap is not quite as large as one might expect. Subjective performance is very snappy and we never experienced any significant wait times when launching applications or navigating the system. Systems with conventional hard drives and or hybrid drives are still at a disadvantage here both from a synthetic benchmark perspective as well as from the actual user experience. 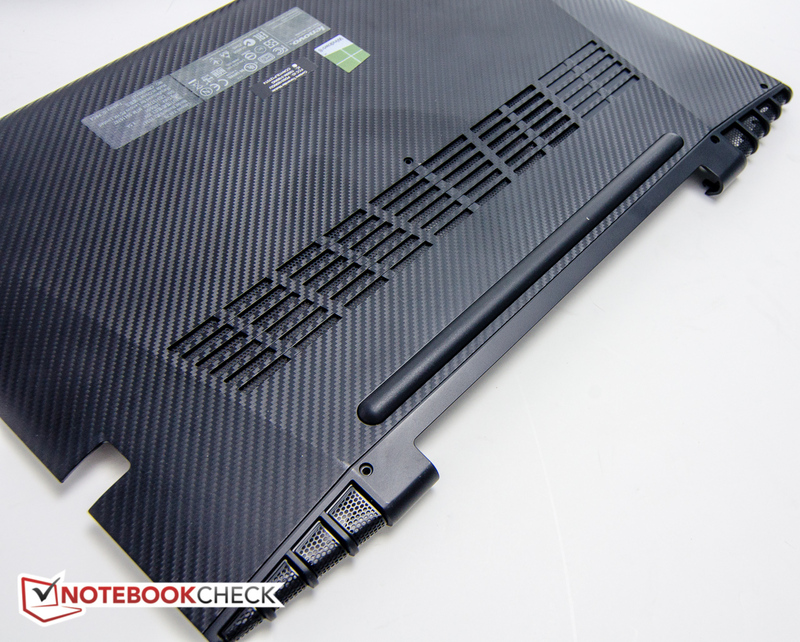 Our review notebook shipped with a 256 GB SSD from Liteonit, model LCS-256M6S. 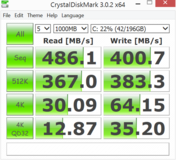 The performance of the drive was not quite what we expected: while the sequential read and write rates in CrystalDiskMark of 486.1 MB/s read and 400.7 MB/s write are decent enough, the picture changes once we move on to the 4K QD32 results. The 12.87 MB/s read and 35.2 MB/s write rates are significantly lower than they should be. 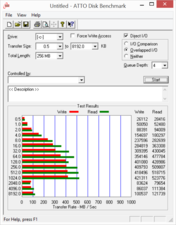 The results of the AS SSD benchmark where downright dismal with scores of less than 200 for most runs. It almost looks like the SSD is running in IDE mode, although AS SSD confirms that iaStorA - the Intel AHCI/RAID driver - is in use. At this point, we are not quite sure what is causing the low scores in AS SSD and we have omitted them until we can clarify. The Y40 models all use the same AMD Radeon R9 M275 GPU, a mid-range DirectX 11 graphics card based on the older Radeon HD 8870M. While theoretically capable of a core clock speed of 925 MHz and a memory clock of 1125 MHz, our monitoring tool never reported frequencies above 1000 MHz, which probably means that Lenovo has chosen to implement a slightly lower memory clock speed. The results of the 3DMark 13 tests are not overly impressive and the M275 trails the Nvidia GeForce GTX 760M - used for example in the Razer Blade 14 - by about 40 - 50 percent depending on the sub test. The results of the 3DMark 11 test are much closer with the Radeon R9 M275 scoring roughly 20 percent lower. Compared to the Nvidia GTX 860M in the larger Y50, the Radeon GPU offers about 40 - 55 percent less performance when running 3DMark 13 and about 40 percent for 3DMark 11. The GPU allows most modern games to be played with decent frame rates at medium to high settings and some older games on ultra with Full-HD resolution. While clearly no match for the Nvidia GTX 860M installed in the larger Y50, which can handle Metro: Last Light on high with 53 fps compared to the Y40's 26 fps, the R9 M275 does better when compared to Nvidia's GeForce GTX 760M. The Razer Blade 14 with the GTX 760M allowed us to play Tomb Raider on high with a frame rate of 69 fps; the Y40 managed a still playable 44 fps. 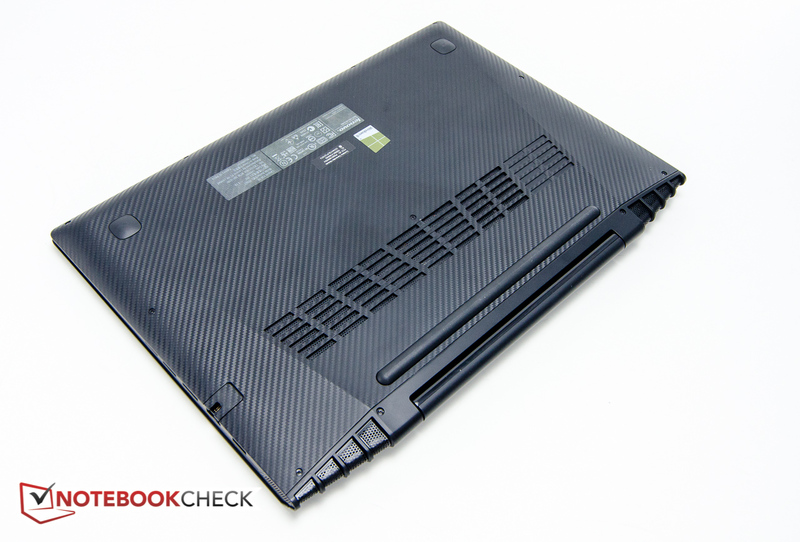 The inexpensive Asus VivoBook S451LB with the Nvidia GeForce GT 740M has no chance and posts lower scores across the board. 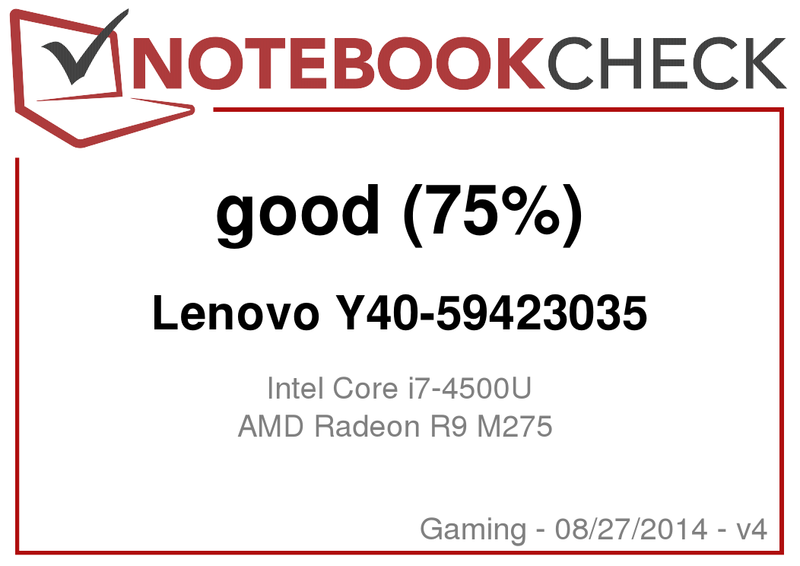 While the frame rates clearly won't satisfy avid gamers, we need to point out that the performance is still decent enough for a series of notebooks starting at $750. 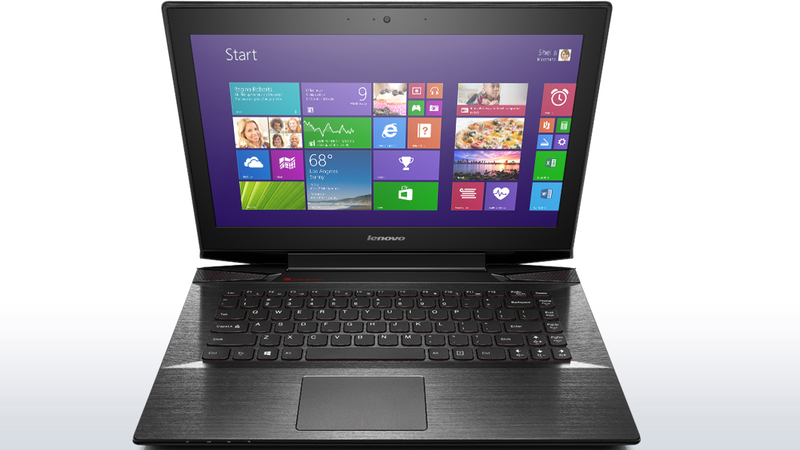 Even the 15.6-inch Y50 is quite a bit more expensive at a starting price of $1100 with a 500 GB hybrid hard drive. AMD's version of the automatic graphics switching between the integrated Intel HD 4400 and the dedicated Radeon R9 M275 does not work nearly as well as Nvidia's Optimus technology in our experience. Even after we had the global settings set to maximum performance and assigned the "high performance" setting for the various games, we still found that a reboot was in order the first time around to make sure that the Radeon was handling the task. On several occasions, we still sometimes inadvertently ended up with the HD 4400 instead when running a benchmark, although subsequent reboots seemed to have fixed the issue. Since the fan is always on, the Y40 is never silent. Even during idle, we recorded an average of 37 dB, which is much higher than the super-slim, but more or less inaudible Razer Blade 14 (less than 30 dB). Other systems like the Gigabyte P34G v2 start out at below 30 dB but have the fans spinning up every so often, which can be more annoying than a constant humming sound. During gaming sessions and during our stress test, the little notebook reached upwards of 45 dB, which is quite loud, but still acceptable due to the frequency range, which is not particularly obtrusive. The bigger Y50 is less noisy in idle mode, but can reach up to 50 dB under very high load levels, as do other gaming notebooks like the Gigabyte P34G v2 or the Dell Alienware 14. 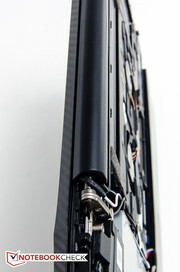 We should mention here that the fan exhaust of the Y40 is located between the single hinge and the display. 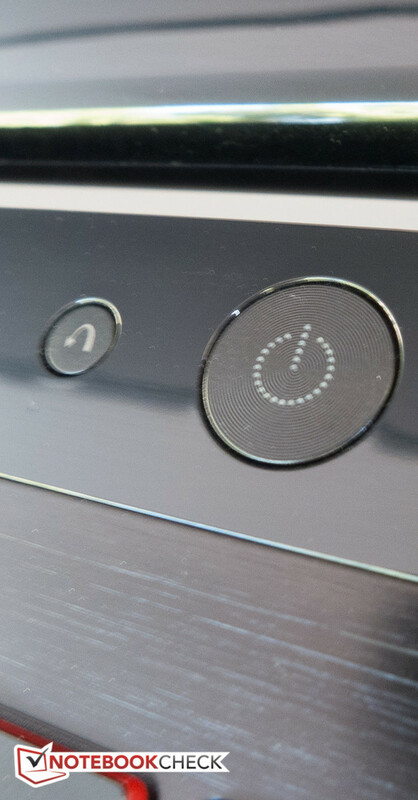 The position of the display thus impacts the noise level to a certain degree: when the screen is tilted away from the user, the perceived fan noise is a little less. 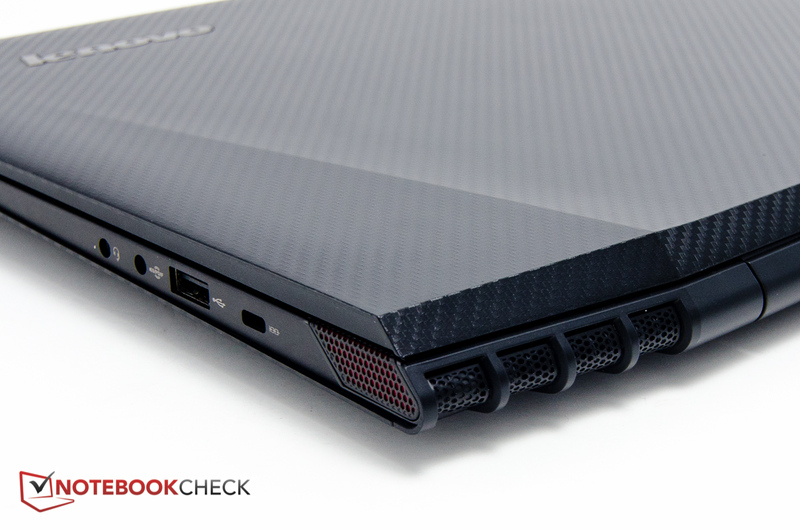 The Y40 is equipped with two cooling fans to keep the temperatures in check. Because the fans are always on and since the system is equipped with a low-voltage CPU and a mid-range graphics card, it's reasonable to expect a fairly cool notebook with few heat-related issues. During idle, the temperatures are uniform across the entire notebook and only about 4-5 degrees C above ambient (a fairly warm 27 degrees C). 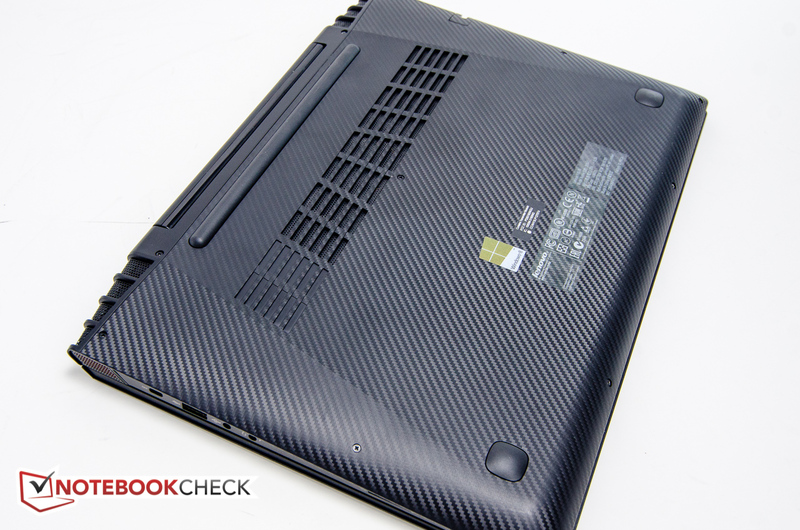 The palm rests stay cool to the touch at just about 31 degrees C.
When subjected to high load levels for extended periods of time (stress test), the notebook heats up considerably, although other systems can get hotter still. We recorded a maximum of 52 degrees C on the bottom left where the CPU and the GPU are located; the coolest spot of about 32 degrees C is on the bottom right of the notebook The temperature distribution on the palm rest is not quite as uniform as well now with the area to the left of the touchpad reaching up to 37 degrees C, while the temperature to the right barely tops 32 degrees C. Still, overall the Y40 does quite well here and we had no issues using the notebook on our lap even for extended periods of time. It's also important to consider that the extremes above are the result of torture tests that can last several hours and thus are not a good indicator of the temperatures encountered during normal use. (-) The average temperature of the palmrest area of similar devices was 28.7 °C / 83.7 F (-8.7 °C / -15.6 F). The two JBL speakers sit on the left and right under triangular-shaped speaker grills. 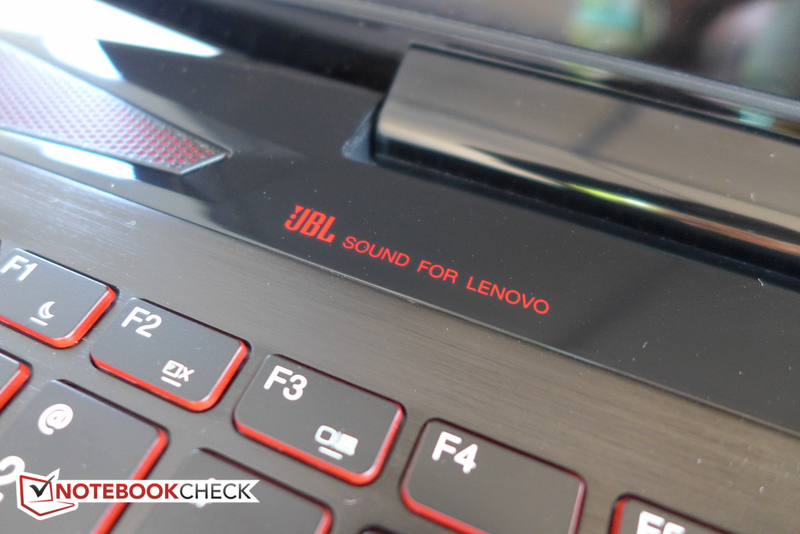 Unlike the Y50 however, the review notebook does not feature a dedicated subwoofer. Bass is therefore clearly lacking, but the overall sound is well-balanced with good mids and clear highs. The maximum volume level is also quite high with no distortions. Lenovo also supplies Dolby Digital Plus V2 software, which allows the user to pick between various settings and customize them if desired. Although the sound quality and the volume is certainly good enough for movies or gaming, we still recommend plugging in external speakers or a good headset when better sound quality is required. 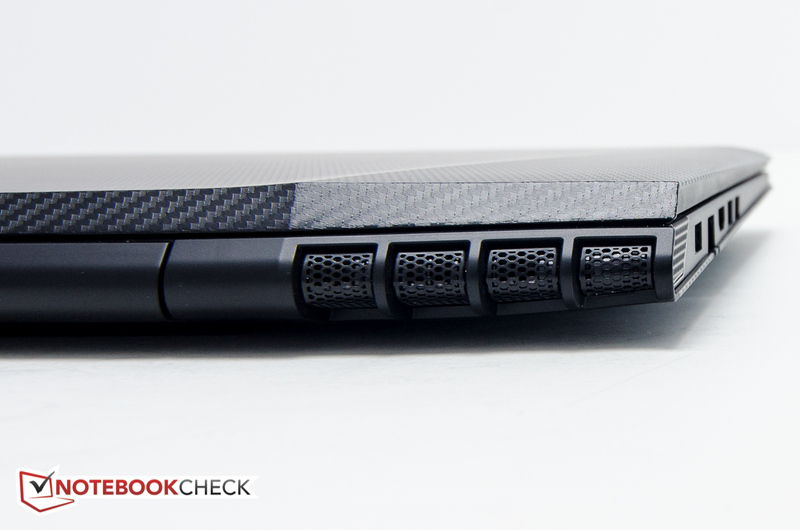 Lenovo ships the Y40 with an integrated 54 Wh battery which is screwed into place. 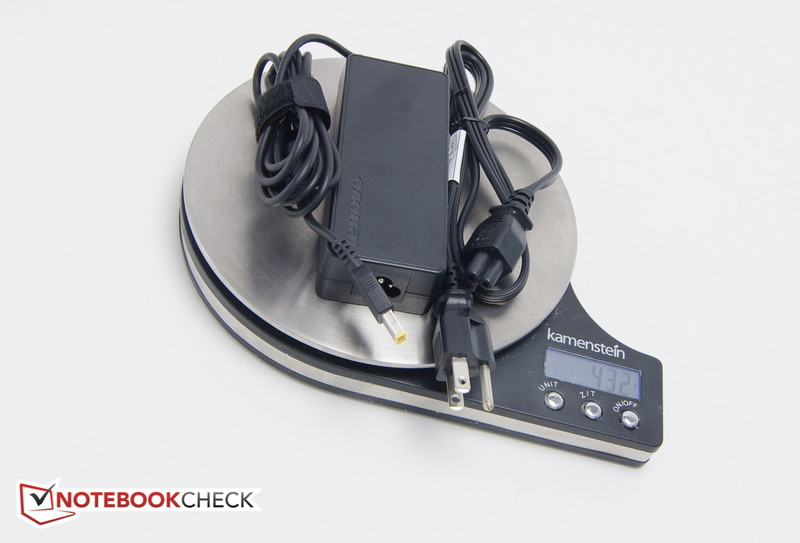 We use the tool Battery Eater Pro with the screen saver and timeouts disabled to assess the battery life under various conditions. To get an idea of the maximum battery life, we turn the brightness to its lowest setting, use the Power Saver profile, disable wireless, and then run the Reader's test. The Y40 lasted over 13 hours. For the significantly more realistic WLAN test, we use the Balanced profile and set the brightness to 150 nits, which is 9/10 in this case. A script then visits different websites to simulate typical browsing conditions. The review notebook shut down after about 8 hours and 30 minutes - a very good result, which easily doubles the run time of most gaming notebooks. The Y50 and the P34G v2 both lasted about 4 hours 30 minutes; the Razer Blade14 less than 4 hours. To determine the minimum battery life, we choose the High Performance power, enable wireless, and set the display to maximum brightness. The notebook shut down after about 1 hours and 45 minutes. As we indicated in our stress test sub-section, we have to elaborate here: after starting the benchmark and letting it run for a while, we noted an estimated run time of 1 hour and 15 minutes. When we returned after the notebook had shut down, Battery Eater reported a run time that was exactly 30 minutes longer. The graph reveals the reason: about halfway through the run, the power draw must have suddenly decreased pretty significantly. Expecting a fluke, we repeated the test - with nearly identical results. We then repeated the test once more, but monitored the process this time. As it turns out, the CPU and GPU both drop from their initial highs of 2.7 GHz and 925/1000 MHz once the temperature rises, which is expected. What took us by surprise is the fact that the notebook does not recover from throttling while running on battery: 40 min into the test, both the GPU and the CPU reported only about 55 degrees C with the CPU and GPU now only working at 800 MHz and 400/305 MHz, respectively. 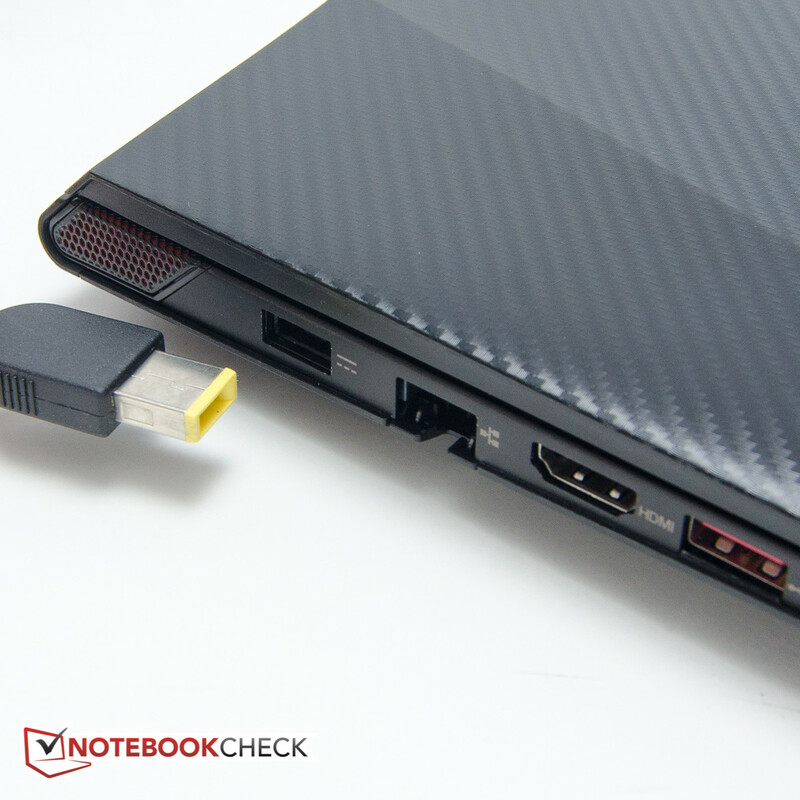 We can only recommend keeping the notebook plugged in when high performance is required. Lenovo's Y40 is a very nice looking, slim and well-built entry-level gaming notebook with a very attractive price. Of course, making a gaming system affordable necessitates some cost-saving measures. The biggest one is the 1080p display panel, which offers pedestrian performance at best with low brightness, low contrast, and some of the worst colors we have seen in a while. The viewing angles are also very restricted, which makes dark scenes in games or movies a chore to watch. The keyboard is spongy with little feedback and - to add insult to injury - does not offer a red backlight like the IdeaPad Y50, but features keys with painted shafts instead. The Radeon R9 M275 is not a high-end GPU and users shouldn't expect playable frame rates at maximum resolution with the settings on high for all current games, although medium settings are usually OK. The behavior of the notebook while running on battery power is also a bit peculiar, so it's probably best to keep the power adapter nearby. 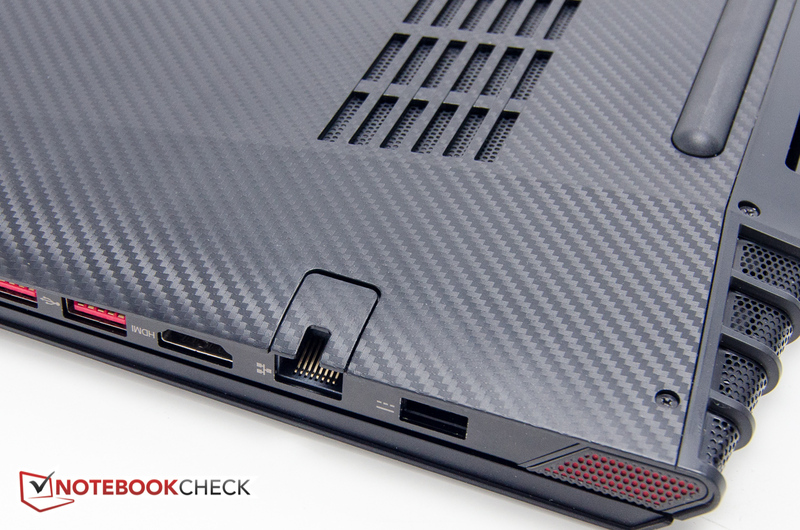 We do like the solid construction and despite the faux carbon fiber, the notebook with its metal palm rest is visually quite appealing. 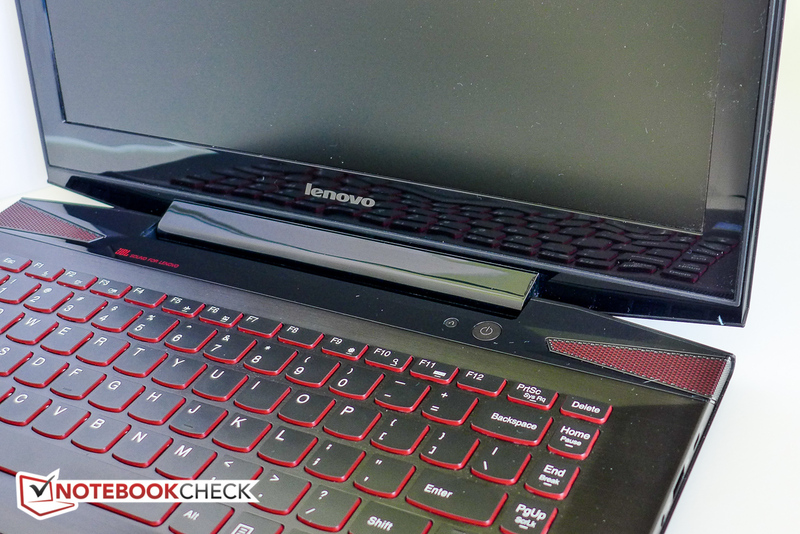 The glossy plastic Lenovo uses for the bezel and the hinge cover do mar the more upscale look somewhat. A 256 GB SSD at this price point is also a welcome addition, since the performance is significantly higher than what's offered by hybrid solutions, although a large number of games will fill up the available space rather quickly. Given the price, the Lenovo Y40 is still a decent entry-level gaming rig for those who don't have a lot of money to spend. We just hope that Lenovo will improve the display down the line or at least offer different choices. An improved TN display and/or an IPS option with a less cheesy-looking bezel. The inconsistent behavior of the notebook when running on battery.